Go, ZenFone, go! Even lower mid-range devices have to have special features today. This is why Asus' ZenFone Go comes with an ergonomic design, HD screen, and removable battery. In this report, we will clarify if the affordable ZenFone Go is convincing. Positive: Low price; beautiful design; high brightness. Negative: Low performance. Positive: Low price; high autonomy. 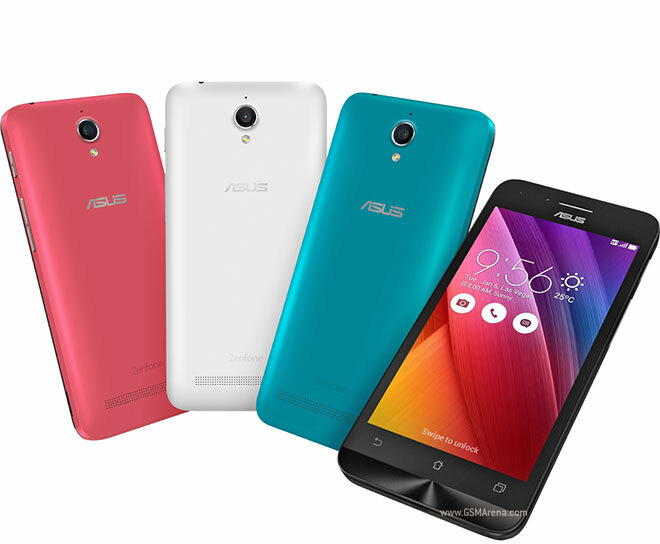 Model: Asus is very well known for their budget-line smartphones. They have been promoting their line-up of the Zenfone Go series. Recently, they introduced the Asus ZenFone Go 5.0 LTE, which is another smartphone under their Zenfone Go budget-line smartphones series. It is also an upgraded variant from the last year’s Zenfone Go 5.0 LTE. The 2nd-gen device with the model number ZB500KL sports almost similar specifications as its predecessor. From the front of the device, it looks similar to last year’s Zenfone Go 5.0 LTE with Asus's famous concentric circles design below the capacitive buttons. While the volume rocker is now placed on the rear of the device, the power button sits on the top edge of the device. The device sports an all-metal body and sports a front facing home button. It comes in Glacier Gray, Sheer Gold, Silver Blue, Glamour Red, Charcoal Black and Pearl White colour options. As for hardware specification, the Asus ZenFone Go 5.0 LTE is powered by a Snapdragon 410 MSM8916 quad-core processor clocked at 1.2 GHz. It packs 2 GB of RAM and 16 GB of internal storage, which can be further expanded by up to 256 GB via the MicroSD card slot. Apart from the onboard storage, Asus is also offering 100 GB of Google Drive storage, free for two years. For display, the Asus ZenFone Go 5.0 LTE is equipped with HD IPS+ display (1280 x 720 pixels), sporting a pixel density of 294 ppi for a reasonable visual appearance. Asus TruVivid technology with improved clarity, offers lighter and beautiful vivid colour. As for audio, the Asus ZenFone Go 5.0 LTE has a pair of sensitive microphones that are expertly tuned and precisely positioned to reduce noise and ensure voice is heard. While the last year’s Zenfone Go 5.0 LTE came with an 8 MP rear camera, it is now upgraded to a 13 MP sensor with f/2.0 aperture. However, the 5 MP selfie camera remains same as on its predecessor. The fingerprint sensor that comes embedded into the front facing home button can detect from 360-degrees. As for operating system, it runs on Android 7.0 Nougat out-of-the-box. Its 2,600 mAh battery is supposed to give 16 hours of talk time on a 3G connection and 13.7 hours of Wi-Fi browsing. The device supports dual SIM dual standby and offers all the basic connectivity options. It measures 143.7 x 70.8 x 11.2 mm and weighs around 150 g. The 2017 Zenfone Go certainly is the phone to look out for especially if you're on a budget but need a well specced phone.